An exceptional toner, the special features and nourishing properties of which you will be able to appreciate from the first application. The high content of precious hyaluronic acid, provitamin B5 and other skin-friendly ingredients is apparent in the special consistency of this product. As with all DR. BAUMANN toners, it contains no alcohol. 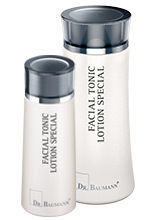 The FACIAL TONIC LOTION SPECIAL is best applied after the CLEANSING MILK SPECIAL and to prepare the skin for the subsequent application of a DR. BAUMANN liposome treatment e.g. LIPOSOME MULTI ACTIVE Super Cure, or the SUPER CREAM.